Green Thermal Energy has launched a range of CO2 Packaged Chillers with capacities from 30kW to 450kW. The GTE-Yukon range is provided in either air or water cooled configuration and is geared towards both production and comfort cooling applications. Designed to provide a natural refrigerant alternative to both specifiers and end users, the innovative GTE-Yukon range now brings the benefits of CO2 refrigeration to the Packaged Chiller sector. Green Thermal Energy states that this is the first standardised range of CO2 Chillers to be available with a full range of options, enabling ease of specification and selection. Able to operate with leaving water/glycol temperatures from +10°C to as low as -30°C, the GTE-Yukon CO2 Chiller range combines application flexibility with high levels of efficiency and performance. The range delivers the highest levels of sustainability and provides a completely future proof cooling system as GTE-Yukon natural refrigerant CO2 Chillers sit outside of the F Gas phase out regulations. However, GTE-Yukon Chillers are equally suitable for projects that require a practical and efficient cooling system as well as those projects that demand the most environmentally-focused natural refrigerant system design. Alongside cooling-only models, GTE-Yukon units combine cooling with high temperature waste heat recovery, delivering cooling and hot water at temperatures up to 80°C. These units are ideal where the free and high temperature zero carbon recovered/recycled waste heat from CO2 cooling can be utilised onsite. Significant cost and carbon savings can be gained from utilising the recycled high temperature waste heat to provide hot water for any application, ranging from hotels or hospitals to food processing plants. GTE-Yukon units can provide hot water that can be used directly within a circulated system or, for example, to deliver make up water to feed steam boiler systems. Manufactured to the highest standards, GTE-Yukon Chillers represent the next generation of well proven CO2 refrigeration and cooling systems. 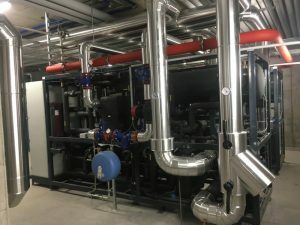 These chillers are provided throughout the UK by CO2 specialists Green Thermal Energy, supported by their manufacturing partner, Northern Italy-based Enex. Garry Broadbent of Green Thermal Energy commented, ‘The GTE-Yukon range has been launched as a result of numerous water/glycol systems being applied in a variety of applications throughout Europe’, continuing, ‘ it was clear that the market was ready for a standardised Packaged CO2 Chiller range and we are pleased to launch GTE-Yukon at a time where the F Gas regulations are generating an increased level of interest in natural refrigerant CO2 cooling systems’. The GTE-Yukon Chiller range is provided with a complete application support service, which offers design to commissioning services, along with the industry-leading Green Thermal Energy CO2 specifier and contractor partner scheme.